, the son of the preceding, was born at Basil, in 1599, and became professor of the Oriental language there, with no less taste and skill in the Hebrew and the Rabbins, than his father. 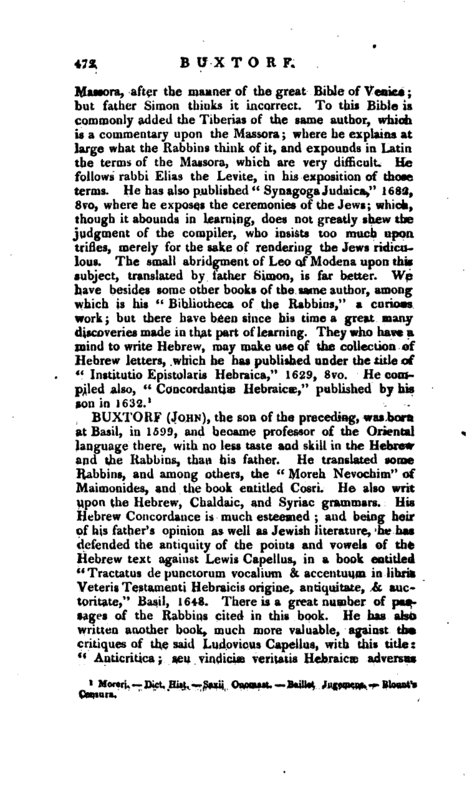 He translated some Rabbins, and among others, the “Moreh Nevochim” of Maimonides, and the book entitled Cosri. He also writ upon the Hebrew, Chaldaic, and Syriac grammars. 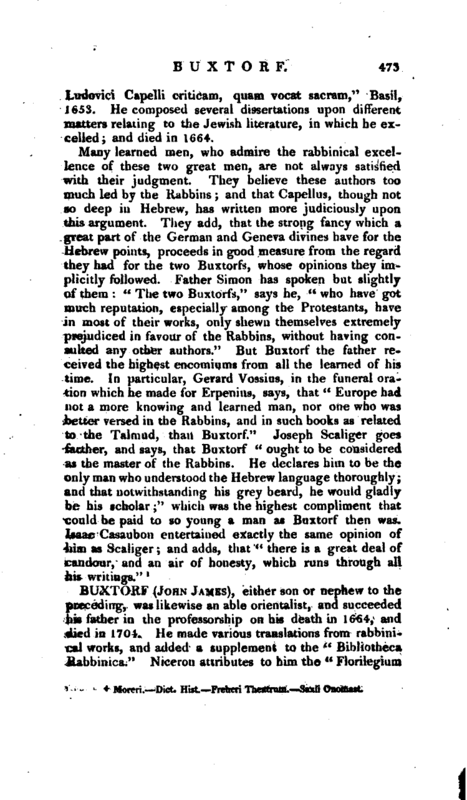 His Hebrew Concordance is much esteemed; and being heir of his father’s opinion as well as Jewish literature, he has defended the antiquity of the points and vowels of the Hebrew text against Lewis Capellus, in a book entitled “Tractatus de punctorum vocalium & accentuum in libris Veteris Testamenti Hebraicis origine, antiquitate, & auctoritate,” Basil, 1648. There is a great number of passages of the Rabbins cited in this book. He has also written another book, much more valuable, against the critiques of the said Ludovicus Capellus, with this title: “Anticritica; seu vindiciæ veritatis Hebraicæ adversus | Ludovici Capelli criticam, quam vocat sacram,” Basil, 1653. He composed several dissertations upon different matters relating to the Jewish literature, in which he excelled; and died in 1664. 1 Moreri—Dict. Hist. Freheri Theatrum, —Saxii Onomast.